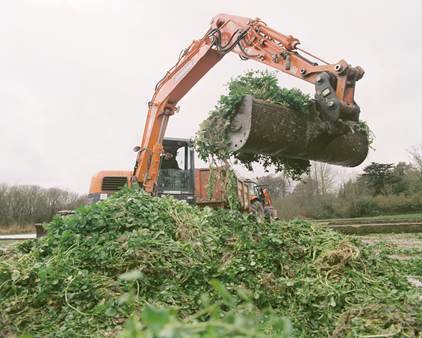 Before watercress crops are established, the farmers need to clean-out the beds from the last crop. The gravel in the bottom of the beds is then prepared by sweeping clean and raking the base smooth. The bottom of the beds are then filled with gravel, to provide an anchor for the watercress plant roots. Harvesting is mechanised and the cleaning out is usually done with a tractor. The project involved hiring an 8 Ton Doosan excavator from HPA. The HPA machines have become an essential part of the seasonal turnaround process on certain sites each year where the farmers are unable to get access for their tractors into the beds. In the UK, the Watercress Company has farms throughout Dorset and Hampshire, which vary in size from just over an acre to as much as 15 acres. Most of the Hampshire farm sites have firm beds, but the Maxwell Farm site in Hampshire has 23 small beds on its 7 acre site and they are so soft that the farmers struggle to get their tractors onto the beds. The Watercress Company has an excellent longstanding relationship with HPA built up over the past 15 years. It’s a testament to the outstanding customer service that they have received over many watercress seasons and the quick lead-times they get from HPA when hiring machines suitable for the seasonal timings and the conditions on their farms. The speed of this turnaround process is critical, so The Watercress Company specifically requested an 8 Ton excavator again. Throughout the seasons they will also hire telehandlers of varying sizes and BW120 rollers from HPA.